Platinum Art Deco diamond ring from the 1930's. Product code: ES6144 Categories: Sold Items, Sold Rings. In 1922 Howard Carter discovered King Tutankhamun’s tomb that sent shock waves around the world for the beautiful and historical discoveries that were found and this coincided at the perfect time – right at the start of the Art Deco era. Not only was so much gained in way of knowledge, but this also resulted in having an influence on jewellery resulting in what is termed “Egyptian revival” where this influence can be seen here in this fabulous Art Deco diamond ring. Hand made in platinum, the ring is set with three vibrant diamonds that total 1.26 carats in weight and are F in colour and Vs to Si in clarity. 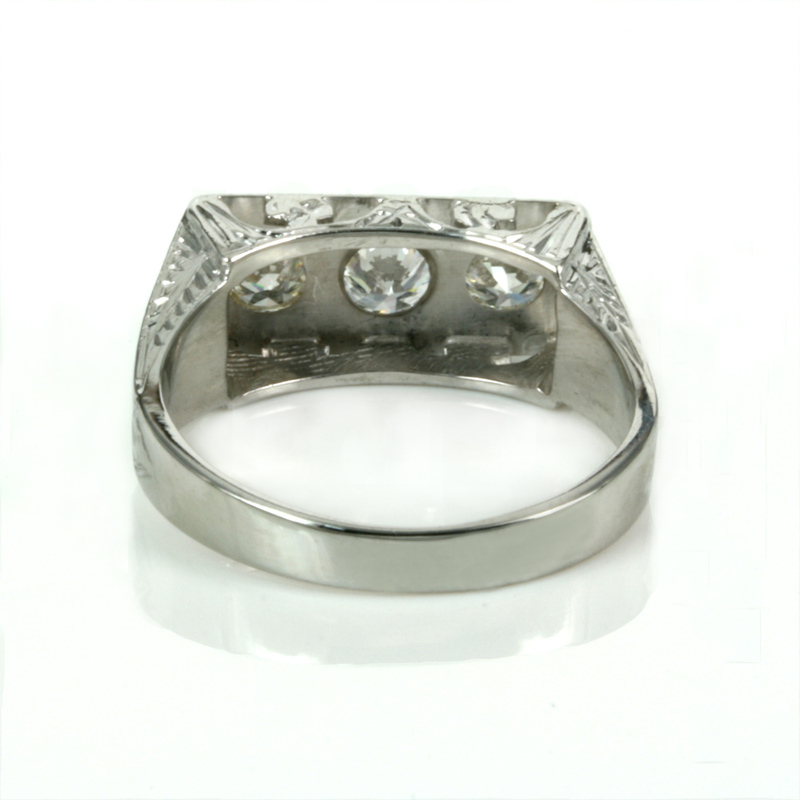 The use of platinum was is often seen in Art Deco rings and was used for its pure white colour and strength. The top of the ring measures 8mm wide by 17.8mm across and then when you admire this ring from the sides including the shoulders you will so easily fall in love with this ring even more and experience why there is nothing quite like a genuine Art Deco ring adorning your finger. On the shoulders, expertly hand engraved is a pattern similar to the palm frond of Egypt with a “modern” twist to it. This detail is so elegant and just highlights what a magical ring this is. This is a stunning ring that would suit any finger including making a wonderful Art Deco diamond engagement ring that will always be admired. No matter what finger or from what angle you look at this ring, you will always be captivated by its beauty and history.